The second session started with a tour of the Tool Room. 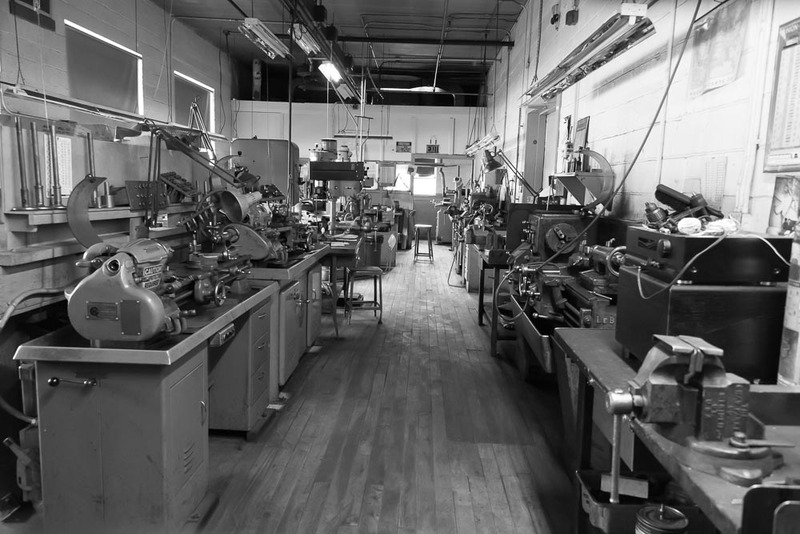 This is Dave’s room since he is responsible for making any new or replacement punches, dies, or gauges as they wear or break. Here is a sample of what the room looks like. The room is made up of a series of machines used for various stages of new/replacement die/punch production. Bridgeport EZtrack used for milling the sizes of holes. Grinders for grinding the part faces. Hardinage speed lathes for round turning and boring for ID (inner diameter) and OD (outer diameter). Indicator indicates the flatness of the tested surface. Whirly Jig for precision grinding of surfaces. Rockwell tester for hardness testing. The Grinding Area is made up of several machines. 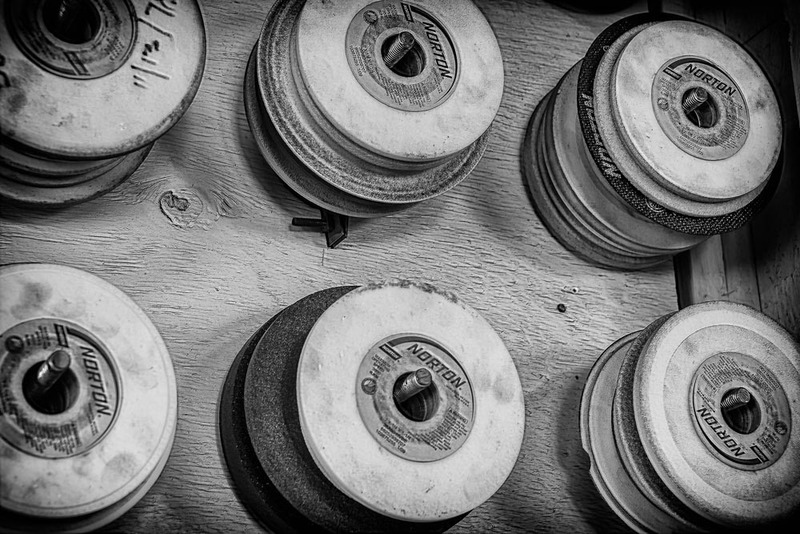 Some use eighty-grit wheels for edge sharpening. Others use forty-six-grit wheels for general purpose grinding. Diamond wheels are used for working carbide dies and punches. Every product produced and sold to a customer has a set of hardened steel gauges that are used for quality audits and inspections. There are two gauges to determine ID; two ring gauges for OD, and two for the plug gauge where a “go-no go” decision is made regarding final product quality. 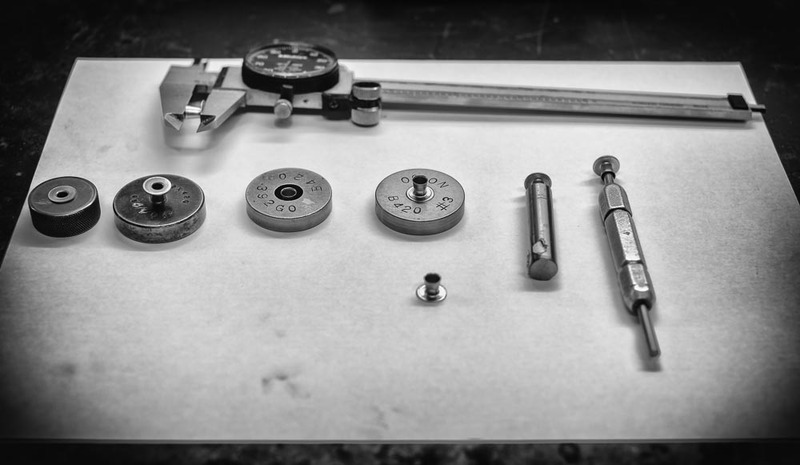 These gauges are primarily used by “feel” and “eyeballing” to determine the tested tolerance. After my tour of the Tool Room, I started to use my camera. 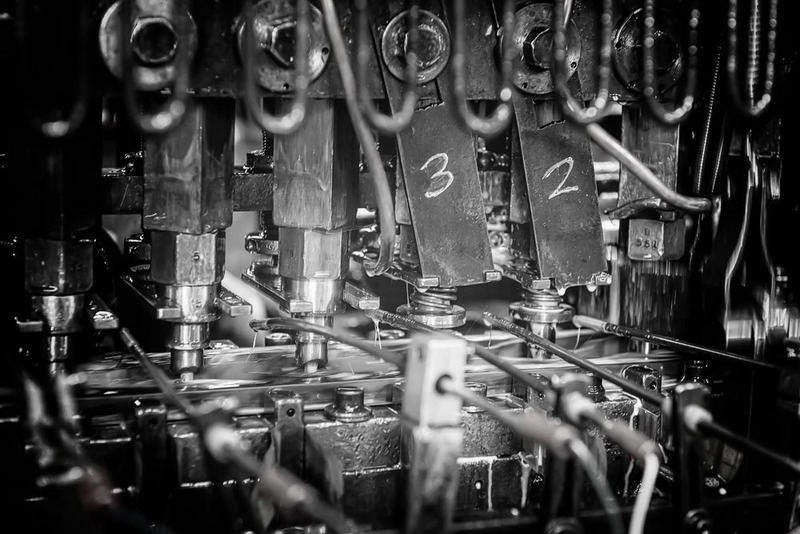 Since I was nearing the end of my session, I decided to take some more test shots, this time of a press in operation. The florescent lighting was adequate to see what was needed but not bright enough for extreme detail. I debated about using a flash but for today I would shoot with existing light, handheld, high ISO. I wasn’t sure what I wanted yet. My camera of choice was the Nikon 800e. The lens I used for this session was the Nikor 24-70mm. 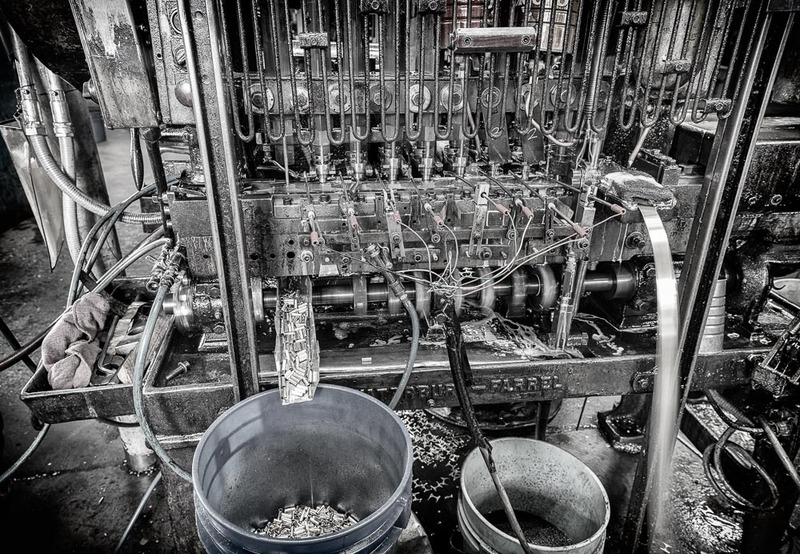 As I started shooting the operating press, I quickly discovered that I had the wrong lens. What I decided I wanted, after watching the press, were intimate closeups of particular parts of the press and the various draws being performed. The intricacy of the parts were fascinating examples of line, shape, and form which were worth exploring. However, I couldn’t get close enough, even at 70mm, since it would be dangerous for me and my equipment. So I packed up for the day to return home to study the shots I had taken. Thanks, Jerry, I am having a ball! Cool! So beautiful. 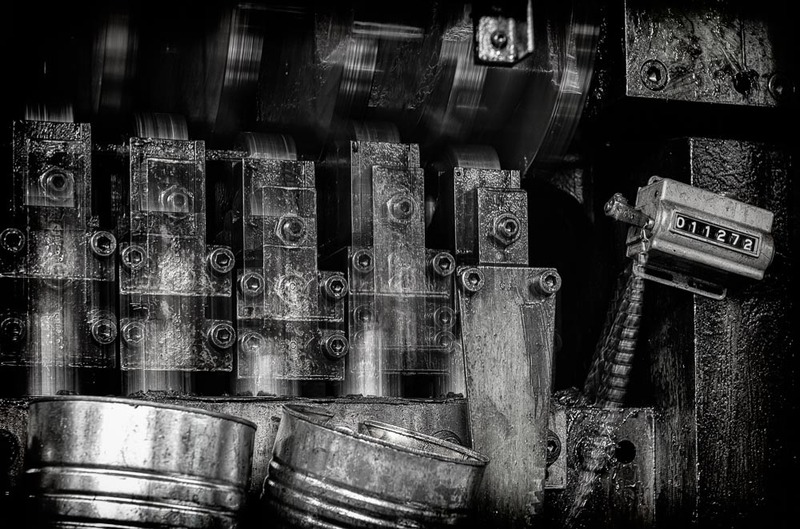 On a whim I googled the term “industrial art” – Wikipedia says stuff like “The primary role of Industrial Arts education is to expose students to a variety of industrial and engineering technologies that improve their understanding of the industrial and engineered world.” Isn’t that what your art is trying to do? You are having fun, creating at the intersection between industry and art, creativity and practicality. I am going to enjoy seeing this grow.